Kids Love Music stimulates the interactive learning and play between parents and children during each parent and me music class. You may recognize it as a mommy and me music class, but we include either parent (daddy and me music class), or even Grandma, Grandpa, Nanny or another loving adult! Kids Love Music offers 5-week sessions which are held at city Parks & Recreation centers in and near Orange County, CA. Children need and desire repetition. Adults often prefer variety. To accommodate both parent and child, Kids Love Music uses the same instruments and puppets for the duration of each 5-week long parent and me music class session. With each new session the puppets, rhythm-band instruments and song selections change. Circle-time songs and Orff instruments may change less frequently. What Music Classes Are Offered? Kids Love Music specializes in three types of parent-participation children’s music classes that are based on the children’s age and developmental stage. Adult participation is required for ALL classes!! Also listed as: Kids Love Music: Babies! 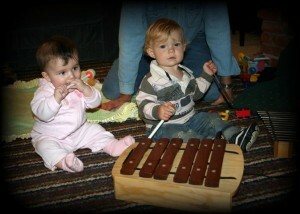 Class Description: Musical bonding time for you and your baby! Learn lap songs, peek-a-boo songs and active chants. Explore rhythm and sound with shakers and drums. Your baby gains motor skills, vocabulary, building blocks for tonal memory and fun with you! Please bring a baby blanket for sitting on the floor. Some materials are available for purchase: a children’s music CD (Baby and Me), peek-a-boo scarf and/or a rhythm instrument. No purchase is required. Age: 4 – 14 months old (not walking). Mix together Christmas songs and music, jingle bell shakers, drums and baby safe glockenspiels Mmm, mmm, good! Also listed as: Kids Love Music: Toddlers! Age: 1 – 2 years old (walking is helpful, but not mandatory). Class Description: Great class for first-timers! Sing, dance and play rhythm instruments together! Explore making music with drums and pentatonic xylophones and glockenspiel – guaranteed to make beautiful music! Your child gains tonal memory, motor skills, cognitive development and fun with you in this shortened version of the Kids Love Music class. Some materials are available for purchase: a children’s music CD (It’s Music Time Again or Sing With Me), a harmonica and a rhythm-band instrument. No purchase is required. Age: 1 – 2 years old (walking is helpful, but not mandatory). Mix together Christmas and winter songs, jingle bells, dancing and drum and xylophone playing. Keep the children active and engaged in this shortened version of the Kids Love Music class. Ages: 1 – 4 years old. Class Description: Come sing, dance and play with your child! Spark your child’s imagination using animal puppets and rhythm-band instruments! Explore making music with drums and pentatonic xylophones, glockenspiel and metallophones – guaranteed to make beautiful music! Your child gains tonal memory, motor skills, cognitive development, and has a fun bonding time with you! Some materials are available for purchase: a children’s music CD (It’s Music Time Again or Sing With Me), a harmonica, and a rhythm-band instrument. No purchase is required. Age: 1 – 4 years old. Mix together Christmas music and winter songs with snowmen, jingle bells, drums, xylophones, singing and dancing. Mmm, mmm, good! When are Music Classes Held? We offer classes all year round. To find the dates when mommy and me (or daddy and me) music classes are held in your area, browse our parent and me music class schedule for each season during the year. Where are Music Classes Held? Our parent-participation music classes are offered through the Recreation and Community Service Department for each city listed below. Once you review the class schedule (listed above by season), go to the corresponding city’s website to sign up for the music class session.